Sports jersey style t-shirt, blue color with great white shark jaws on the front and jersey number and the word "sharks" on the back. High quality, soft cotton material. 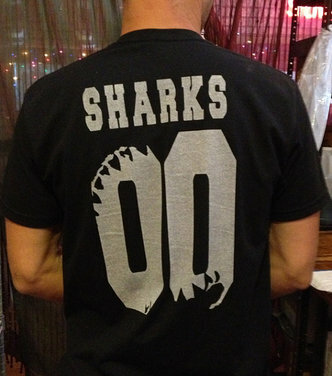 Sports jersey style t-shirt with great white shark jaws on the front and jersey number and the word "sharks" on the back. High quality, soft cotton material.